UPDATE: Thanks to all who came out and supported our event! Check out fun photos of the night here. 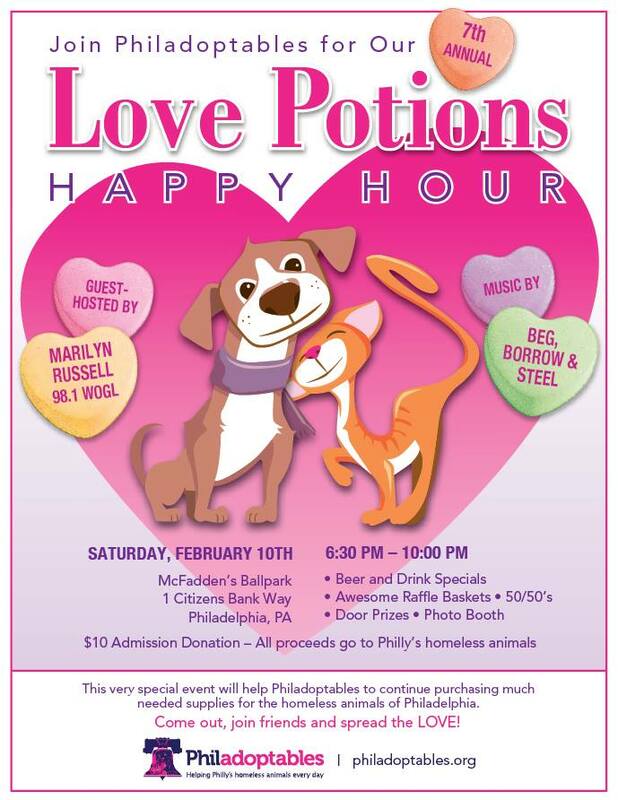 Philadoptables’ 7th annual LOVE POTIONS Happy Hour is coming up! Join us on Saturday, February 10th at McFadden’s Saloon Ballpark for a night of fun with friends and awesome raffles. Marilyn Russell of WOGL 98.1 will be hosting with music by Beg, Borrow & Steel. All proceeds go to help Philly’s homeless animals. Come out, join friends and spread the LOVE! 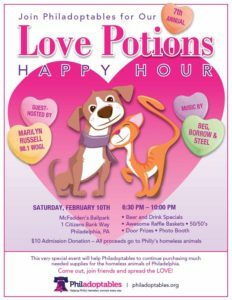 This very special event will help Philadoptables to continue purchasing much needed supplies for the homeless animals of Philadelphia’s animal control shelter. Click to share and RSVP!